Bankruptcy Attorney | The Law Office of Emil Fleysher, P.A. Bankruptcy Relief | The Law Office of Emil Fleysher, P.A. 2. What are the benefits of Bankruptcy? 3. What are the drawbacks of Bankruptcy? 4. What are the alternatives to Bankruptcy? 5. What are the differences between Ch. 7 and Ch. 13 bankruptcy? 6. What effect will filing for bankruptcy have on my credit? 7. How can an attorney help me with my Bankruptcy? 8. How much will it cost to file for Bankruptcy? More and more Floridians in the Miami, Ft. Lauderdale, and West Palm Beach areas are asking this question. A fundamental goal of the federal bankruptcy laws enacted by Congress is to give debtors a financial “fresh start” from burdensome debts. According to the United States Supreme Court, bankruptcy “gives to the honest but unfortunate debtor…a new opportunity in life and a clear field for future effort, unhampered by the pressure and discouragement of preexisting debt.” This goal is accomplished through the bankruptcy discharge, which releases debtors from personal liability from specific debts and prohibits creditors from ever taking any action against the debtor to collect those debts. Call (888) 886-0020 to speak with a South Florida Bankruptcy Attorney or send an e-mail to efleysher@fleysherlaw.com with your questions about Chapter 7 bankruptcy and Chapter 13 bankruptcy in Florida. The two primary benefits of bankruptcy are the Automatic Stay and the Discharge of debt. The “automatic stay” is a rule that prevents any creditor from doing anything at all to enforce a claim against a debtor during the bankruptcy case. Examples of actions by a creditor that would violate the stay include (1) filing a new lawsuit, or continuing to press a lawsuit that had already been filed; (2) sending dunning letters or making phone calls in an attempt to collect a debt; (3) filing a “financing statement” to perfect a security interest; (4) refusing to issue a transcript of your schooling; and (5) canceling your driver’s license. Exceptions to the Automatic Stay include criminal prosecution, paternity proceedings, litigation to collect child support or alimony, repaying a loan from certain types of pensions, and IRS audits. With residential real estate leases, landlords seeking to evict tenants are free to complete evictions if the landlord already has a judgment of possession or where the eviction is based on endangerment or use of illegal substances on the leased premises. Moreover, the automatic stay doesn’t stop or postpone actions to suspend driver’s licenses and revoke professional licenses. A bankruptcy discharge releases the debtor from personal liability for certain specified types of debts. In other words, the debtor is no longer legally required to pay any debts that are discharged. The discharge is a permanent order prohibiting the creditors of the debtor from taking any form of collection action on discharged debts, including legal action and communications with the debtor, such as telephone calls, letters, and personal contacts. Call (888) 886-0020 to speak with a South Florida Bankruptcy Attorney or send an e-mail to efleysher@fleysherlaw.com with your questions about the benefits of Chapter 7 bankruptcy and Chapter 13 bankruptcy in Florida. What are the drawbacks of Bankruptcy? Not all debts are discharged. The debts discharged vary under each chapter of the Bankruptcy Code. Section 523(a) of the Code specifically excepts various categories of debts from the discharge granted to individual debtors. Therefore, the debtor must still repay those debts after bankruptcy. Congress has determined that these types of debts are not dischargeable for public policy reasons (based either on the nature of the debt or the fact that the debts were incurred due to improper behavior of the debtor, such as the debtor’s drunken driving). The most common types of nondischargeable debts are certain types of tax claims, debts not set forth by the debtor on the lists and schedules the debtor must file with the court, debts for spousal or child support or alimony, debts for willful and malicious injuries to person or property, debts to governmental units for fines and penalties, debts for most government funded or guaranteed educational loans or benefit overpayments, debts for personal injury caused by the debtor’s operation of a motor vehicle while intoxicated, debts owed to certain tax-advantaged retirement plans, and debts for certain condominium or cooperative housing fees. Call (888) 886-0020 to speak with a South Florida Bankruptcy Attorney or send an e-mail to efleysher@fleysherlaw.com with your questions about the drawbacks of Chapter 7 bankruptcy and Chapter 13 bankruptcy in Florida. If your debts are less than your annual salary but still too high to pay, my office can help negotiate a debt settlement. Bankruptcy attorneys generally enjoy a greater degree of leverage in dealing with collection companies and creditors because they know that they can either accept the terms and amount that my client is willing to pay, or they can get nothing if my client decides to file for bankruptcy. Generally, I am able to negotiate a 40% – 80% reduction in the debt and payment terms of up to 6 months. Call (888) 886-0020 to speak with a South Florida Bankruptcy Attorney or send an e-mail to efleysher@fleysherlaw.com with your questions about alternatives to bankruptcy and debt settlement in Florida. A Chapter 7 bankruptcy case does not involve the filing of a plan of repayment as in Chapter 13. Instead, the bankruptcy trustee gathers and sells the debtor’s nonexempt assets and uses the proceeds of such assets to pay holders of claims (creditors) in accordance with the provisions of the Bankruptcy Code. In addition, the Bankruptcy Code will allow the debtor to keep certain “exempt” property, but a trustee will liquidate the debtor’s remaining assets if there are any. A slightly broader discharge of debts is available to a debtor in a Chapter 13 case than in a Chapter 7 case. Debts dischargeable in a Chapter 13, but not in Chapter 7, include debts for willful and malicious injury to property, debts incurred to pay non-dischargeable tax obligations, and debts arising from property settlements in divorce or separation proceedings. Although a Chapter 13 debtor generally receives a discharge only after completing all payments required by the court-approved (i.e., “confirmed”) repayment plan, there are some limited circumstances under which the debtor may request the court to grant a “hardship discharge” even though the debtor has failed to complete plan payments. Such a discharge is available only to a debtor whose failure to complete plan payments is due to circumstances beyond the debtor’s control. The scope of a Chapter 13 “hardship discharge” is similar to that in a Chapter 7 case with regard to the types of debts that are excepted from the discharge. In a Chapter 7 case, the court usually grants the discharge 60 days after the first date set for the 341 meeting. Typically, this occurs about four months after the date the debtor files the petition with the clerk of the bankruptcy court. In a Chapter 13 case, the court generally grants the discharge as soon as practicable after the debtor completes all payments under the plan (typically four years from the date of filing). Call (888) 886-0020 to speak with a South Florida Bankruptcy Attorney or send an e-mail to efleysher@fleysherlaw.com with your questions about the effect of Chapter 7 bankruptcy and Chapter 13 bankruptcy on your credit. What effect will filing for bankruptcy have on my credit? A bankruptcy legally can remain on your credit report for up to 10 years, but its effect on your credit score can start to diminish the day your case is closed — if you adopt responsible credit habits such as paying your bills on time, using only a small portion of your available credit and not applying for too much credit at once. One common problem people emerging from bankruptcy often face is that credit reports frequently show accounts as open and overdue — when in fact they were closed and the obligations wiped out as part of the bankruptcy. If you encounter this, you need to contact the credit bureaus and insist that those accounts be properly reported as “included in bankruptcy.” Our firm will work with you following your bankruptcy to help ensure that you know what needs to be done to improve your credit. Call (888) 886-0020 to speak with a South Florida Bankruptcy Attorney or send an e-mail to efleysher@fleysherlaw.com with your questions about the effect of Chapter 7 bankruptcy and Chapter 13 bankruptcy on your credit. How can an attorney help me with my Bankruptcy? Individuals are allowed to represent themselves in bankruptcy proceedings. You may be tempted to declare bankruptcy without a lawyer’s assistance. The process may appear simple. You may wish to avoid involving others in a situation that is already stressful. And obviously, money can be tight during this process. However, there are excellent reasons to ask for an attorney’s advice and assistance during any bankruptcy. Information. Bankruptcy law can be complex. A bankruptcy can take several months to complete. This can add stress to what is already a bad situation. An attorney who practices in bankruptcy law can help you to understand this process. Your attorney can offer you strategies and alternatives that you might not have known about. Having this information can be vital to planning your bankruptcy. An attorney can also give you valuable advice during the process of a bankruptcy. Expertise. Bankruptcies require a lot of paperwork. 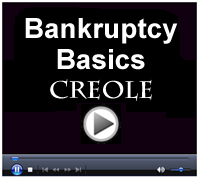 Different bankruptcy courts have different rules. You must provide the bankruptcy court with information on all of your debts, property, and financial information. Bankruptcies involve communication with the court, creditors, and trustees. You must also follow the rules specific to the court in your jurisdiction. All paperwork for a bankruptcy must be filled out correctly, or you can risk not having your debts cancelled. Bankruptcy documents are randomly audited to prevent fraud. If you make a mistake in providing information, you can face prosecution for fraud. Obviously, the best way to protect yourself is to get the help of a lawyer who has experience in these issues. To get the most out of your bankruptcy proceeding and protect yourself from mistakes, it is vital to get an attorney’s assistance. An attorney who practices in bankruptcy law will understand how to submit information to the courts and to your creditors, to ensure that your debts will be discharged. Protection. Even after you retain a lawyer, your creditors can still contact you. However, a bankruptcy attorney can help to stop harassing phone calls. Having someone else take over the hassle of dealing with your creditors can save you time and energy—and make sure that you gain peace of mind during as well as after the bankruptcy process. Your attorney can also help you make sure that debts discharged during your bankruptcy do not show up on credit reports in the future. Bankruptcy can be a painful process, but there are ways to reduce the stress involved. An attorney can help you get the most out of your bankruptcy, prevent mistakes, and protect you before, during, and after the filing process. The Law Office of Emil Fleysher, P.A. helps South Floridians just like you living in and near Miami, Ft. Lauderdale, and West Palm Beach file for Personal Bankruptcy. Call my office at (888) 886-0020 to schedule a free consultation in which we can discuss your situation and figure out which options will work best for you. How much will it cost to file for Bankruptcy? The average fee you can expect to see attorneys in South Florida charging for Ch. 7 Bankruptcy representation ranges from $1,500 – $3,000. The Bankruptcy Court’s suggested fee for Ch. 13 Bankruptcy representation is $3,500. This fee can go up if you require motions to value property, cram/strip liens, etc. Chapter 13 is more expensive due to the added complexity and additional hearings that must be attended by your bankruptcy attorney in order to get your payment plan confirmed by the court. One important thing to find out when comparing bankruptcy attorney fees is whether the quoted fee includes the mandatory filing fee and/or the costs (i.e., the pre-petition credit counseling course, the post petition financial management course, obtaining credit reports, etc.). Another important thing to find out is whether you will be getting personal attention from your attorney. Depending on the way the law firm is set up to operate, you may either get an attorney that is with you every step of the way and communicates with you throughout your bankruptcy, or you may get an attorney that you only see at the initial client meeting and/or the Creditor’s Meeting. It is important to feel confident and comfortable throughout yout bankruptcy and this can only be achieved if you are getting the necessary personal attention that a good bankruptcy attorney should provide. Non-attorney bankruptcy preparation services can be a tempting proposition for many in need of filing for bankruptcy but unable or unwiling to pay an attorney’s fee. Although I am an attorney and I am obviously biased, I would strongly recommend against hiring one of these companies to prepare your bankruptcy petition for you. Under Federal law, these non-attorney preparing companies are only allowed to compile the petition for you based on the information you give them and are banned from offering any legal advice. I have attended many Creditor’s Meetings where the debtor who hired a non-attorney preparing company was sent away to amend their petition, had their case dismissed, or worse, was forced to surrender their property to the Trustee. If you are unsure as to how to go about getting your bankruptcy petition filed, call my office at (888) 886-0020 and I would be happy to provide some insight or guidance. If married, do you intend to file with your spouse? Bankruptcy law provides you the option of filing with or without your spouse. Your household size includes any family members or dependents that live with you. What is your approximate monthly household income? What are the sources of the household income? What is your total approximate Unsecured Debt? Click on the option that best describes the total amount you owe on Credit Cards, Department Store Cards, Cash Advances, Personal Loans, Payday Loans, and Medical Bills. If you are married, what is your spouse's total approximate Unsecured Debt? Click on the option that best describes the total amount your spouse owes on Credit Cards, Department Store Cards, Cash Advances, Personal Loans, Payday Loans, and Medical Bills. Are your wages and/or bank account being garnished? Click "Yes" if a creditor is taking money out of your paycheck or has a freeze on your bank account. If you own your home, please provide the property address. Are you a Defendant in a pending Foreclosure case? Click "Yes" if you are a named defendant in a pending foreclosure case. Please provide the Year, Make, and Model of any vehicles in your name. Please provide the Year, Make, and Model of any vehicles in your spouse's name. What is your primary goal in filing for bankruptcy?